The way the human body works is amazing, right? The way you are just able to do things without really having to think about them? It’s pretty cool, don’t you think? Anyway, remember how in cartoons and shows where certain bodily functions would be done by a tiny workforce inside your body? Well, that’s what Homo Machina is about. Inspired by the artworks of scientist Fritz Khan, Homo Machina charts the day of a person waking up, going to work and then going on a date in the evening. 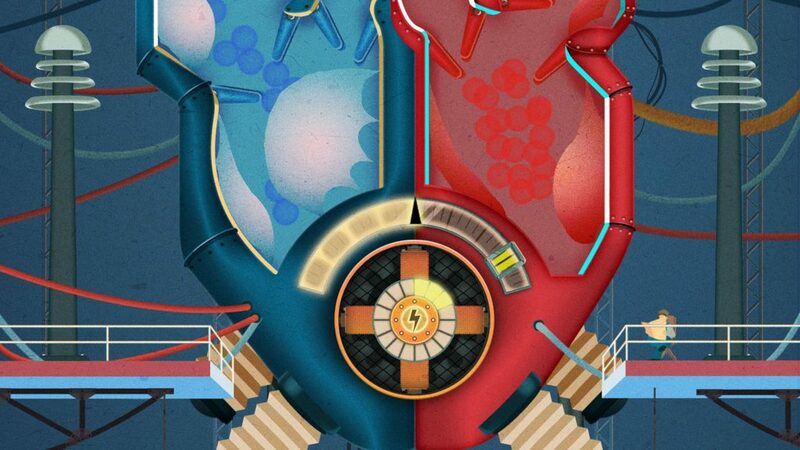 As part of the crew keeping them ship shape it’s up to you to move between the various bodily functions and prod, swipe, poke and strum to fulfil the tasks at hand. The body is mapped out like a steampunk robot with cogs, pistons, cranks, and old fashioned light bulbs on top of consoles. Starting with thumping machines to start up the central nervous system and catching a whiff of the scent of coffee, you’ll find yourself in control of mastication – chewing up food and absorbing it into the system before heading to work and ensuring the body parts work to fulfil the daily job. The thing is, as fun and clever all this bits and bobs are Homo Machina runs out of ideas quickly, so much so that when you reach the end of it’s hour long run time you’ll be asking yourself “Is this it?”. This feeling is made worse by the puzzles themselves not being challenging in any way; although it can be difficult to tell which elements can be interacted with and which ones are just set dressing. Basically apart from one puzzle where part of the function of the ear is portrayed as an oscilloscope where you need to match the wave patterns, you won’t really have much trouble going through this. Don’t misunderstand me here, the ending is really touching in a clumsy blundering way, but I feel it comes in too soon. We know what our bodies go through in a day, and it’s obvious that these actions that we’re performing take place in a split second, but I feel Darjeeling could have elongated the processes and made us perform more elements of a daily routine (driving a car, going to the toilet, or having a shower) it would have been great if the game could have gone on a bit longer, and unfortunately, once it’s over, the desire to go through it again just doesn’t materialise. This brevity is disappointing because Homo Machina is incredibly charming. The way the little workers interact with each other, how the machinery works and the ending is all nice and twee to watch unfold, that’s why it would have been great if there had just been a little bit more of it. As a result what’s here is like a dinner at a fancy restaurant, it’s lovely to experience, but it’s a bit pricey and the satisfaction you get is short lived. At the end of it all, you’ll be wishing you had a palate cleanser. A superbly realised little game let down by a lack of things to do.